Low impact exercise, like water swimming, is significantly proven to help your pet. From building muscle tone, loosening joints, relaxing muscles, increasing flexibility, and reducing stress, pain, and anxiety, swimming is the most recommended and valued exercise to extend the life of your pet.Dip’n Dogs offers Hydrotherapy for dogs in Orlando, FL who need water therapy related to an orthopedic condition, Fitness swimming for canine athletes who need an intense but completely safe exercise, and Swimming lessons for dogs of any age who may have a fear of water or a traumatic event associated with swimming. During your dog’s assisted swim, Rachel is always in the pool with them, guiding and monitoring their health. Paw parents are very much encouraged to be in the room to observe and be a part of the session. Each session is specifically catered to each individual dog to help provide them with maximum benefits and consists of 30 minutes. Dip’n Dogs indoor hydrotherapy swims are performed at a facility located in Orlando, FL. 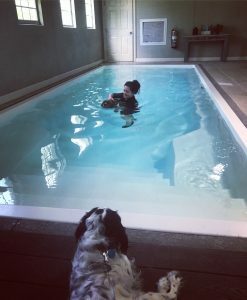 This location provides the ONLY indoor dog therapy pool in the state of Florida.